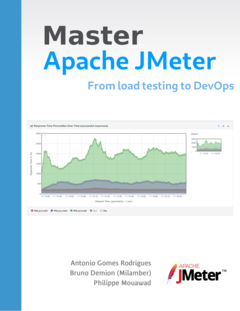 In this short article, we will see how to get the most out of JMeter. GUI mode is for creating the test plan, checking it, debuging it BUT NOT FOR MASSIVE LOAD TEST . AWT Event Thread will disrupt your Load Test. Default JMeter java configuration comes with 512 Mo and very little GC tuning. First ensure you set -Xmx option value to a reasonable value regarding your test requirements. Then change MaxNewSize option in jmeter file to respect the original ratio between MaxNewSize and -Xmx. Finally try tuning GC options only if you master this domain. XML is verbose, it takes resources to be written (CPU and memory) and for analysis, CSV is great so forget about XML. Furthermore, for massive load tests there are many result data you don’t need. Post-Processor and Assertions have a cost. These 2 implementations fit 99% of requirements. Although you can be lazy and choose the language you know, FORGET ABOUT IT. Use the most efficient option, which is JSR223 + Groovy + Caching (supported since JMeter 2.8 in external script and since JMeter 2.9 also supported with embedded scripts). Using Groovy is as simple as adding groovy-VERSION-all.jar in <JMETER_HOME>/lib folder. Once you reach the limits of one machine, you can switch to distributed or remote testing. Update 22th July 2014, this mode is now the default since JMeter 2.9.
remove some data from the SampleResults as the response body, but do you need response body during a High Load Test, NO, DEFINITELY NO ! He currently works as an Architect and technical expert for Ubik-Ingenierie where he leads among other things the development of UbikLoadPack a set of Commercial Plugins for Apache JMeter allowing to load test different protocols like HLS, GWT, Flex.